"This web site reflects four years of research and writing centered around a biography of Bob Worthington I'm now completing. The interviews consist of discussions I had with Guadalcanal Veterans; I'm posting their stories here as a tribute to those men on the 60th Anniversary of the invasion (August 7, 2002); I hope to add many more interviews in the future." -Marc Bonagura, author of "The Tiger is Dead"
Many thanks to over 40,000 (and growing) visitors to this site over the last 13 plus years! We hope to keep this site going strong and to keep the memory alive of all the great men and women of the World War II generation through their own words in the interviews contained here. Please visit often and share the research materials! I can be reached at mbonagura@brookdalecc.edu. The Tiger is Dead first went on line for the 60th anniversary (August 7, 2002) of the USMC landing on Guadalcanal—August 7, 1942. It’s been ten years and more than 27,000 visitors have been to the site. For me, this work is truly a labor of love. Doing the interviews and meeting veterans of the Guadalcanal campaign is certainly one of the highlights of my life, and I’m so happy that some of their family members have been able to hear the interviews; in many cases these men never spoke of their experiences before they talked to me. Since most of the people interviewed here have passed away, their words have become that much more important. I hope people will continue to visit the site and always remember all the great men and women of the World War II generation—I completely agree that they are the greatest generation. I have to give special thanks to Bob Worthington because without his insistence and support I would never have embarked upon this project in the first place. I only knew Bob for a few years, but it was a relationship I treasured. He passed away before the site ever went on line, but I know his children have visited many times. Bob made an indelible impression on me, one that will remain for the rest of my life. For the 70th anniversary, I’ve included some interesting “then and now” photographs from Pete Flahavin, an Australian who is an expert on Guadalcanal history. 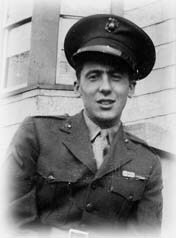 He has visited Guadalcanal many times in his life, and his private collection of photographs and memorabilia is amazing. Pete will be there for the 70th anniversary ceremonies; I hope to get some reports from him in the coming weeks. Thank you, Pete, for being a friend and keeping me in the loop of all the latest (and historical) happenings from Guadalcanal. Click here to see the 70th anniversary photos. We would like to announce that the gravesite of Bob Worthington has been vandalized. We deeply regret this injustice and lack of respect for a great American and his family. We owe it to Bob and his family to restore his final resting place to one of respect and revereance. If anyone has any information regarding this crime, please contact me via e-mail at mbonagura@brookdalecc.edu or by phone at 908-358-8183. Another one of our veterans has died. "We would like to extend our sympathy and prayers to his family and friends. I have many fond memories of Jerry. He was a great person to interview, and I was continually impressed by his knowledge of history and World War II in particular. Jerry was an avid reader of history and probably forgot more than most of us will ever know. Jerry also had a great sense of humor, but you'd better not ask him a question you didn't really want the answer to because he was going to serve it to you straight up -- no bull -- just the truth. 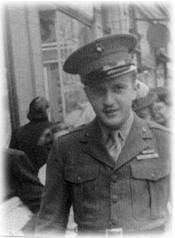 What can I say other than he was a great man -- when I think of the old breed of marines, he's the person I think of. I wish he and my father could have met because I believe they would have gotten along very well. There will never be another like Jerry, but I'm glad we have these interviews so people will always be able to keep his memory alive. I'll miss you Jerry! I really enjoyed the time I got to spend talking with you and Evonne. I know you're in a better place!" his time in Hell and we hope he is now in a better place." Our thoughts & prayers go out to Dave's family. He will be missed. Read the Book for FREE! "The Tiger is Dead" is now available for free download, for a limited time only. This is my gift to all the people, including guests, friends and family members, who have visited my site over the past few years (over 2,000 people). Here's your chance to read an advance copy of my book for free! Click here to view or download a PDF file of the book. plus new photos of Dave Weinstein added! BROOKDALE PROGRAM A BIG SUCCESS! On Thursday evening, February 27, 2003, Brookdale Community Colleges Center for World War II Studies and Conflict Resolution sponsored an evening with Brookdale English Professor Marc Bonagura and five veterans of the Guadalcanal Campaign: Sam Stanislao, John Setteducati, Dave Weinstein and Jerry Federico.Well over 50 people attended the lecture/discussion. The veterans were accompanied by their wives Julie Stanislao, Florence Setteducati, Alice Weinstein and Evonne Federico. The program lasted over an hour and a half with the Guadalcanal vets serving as a panel, commenting and answering questions from the audience. It was a rare opportunity for these men to get together, some of whom havent seen each other in 60 years! 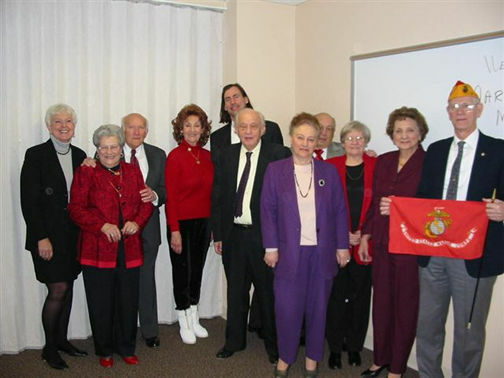 The veterans were picked up at their homes by limousine service and driven to the college in Lincroft, New Jersey where they enjoyed an informal dinner at the Brookdale Community College Student Center before attending the event. Brookdale Colleges Paul Zigo, Director of Off Campus Services and the Director of the World War II Center, acted as emcee for the event, which was also attended by Brookdale Vice President Dr. Johanna Kobran. Featured in the picture below are (from left to right) Johanna Kobran, Brookdale Colleges Executive Vice President for Education/Student & Outreach Services, Julie Stanislao, Sam Stanislao, Trudi Bonagura, Marc Bonagura, Dave Weinstein, Alice Weinstein, Jerry Federico, Evonne Federico, Florence Setteducati, and John Setteducati.